Duration: Approximately 8 hours 30 minutes, including lunch - plodding up. As noted in other pages, Ptarmigan is a favorite of mine. It is just a short drive from my house, and it starts off immediately with a steep incline. On this hike, I was by myself, and while it was both hazy and cloudy, weather was not an issue. There still were some remnant snow fields that had to be negotiated, and based on the tracks in the snow fields, I was the only one to summit on this day. My hike up was very slow, almost plodding, taking 5.5 hours to ascend, and only 3 hours to descend. As usual, I took the old road up instead of what has become the main trail. My loop hike from 1995, says that the road is 0.8 miles shorter each way. 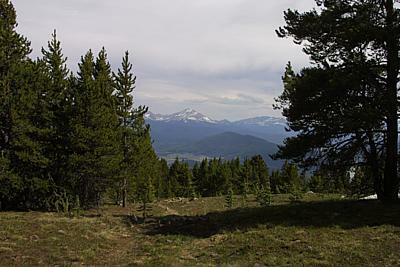 Mary Ellen Gilliland's "The New Summit Hiker", using the alternate route, has this hike as 4.6 miles and 6 hours. Using the National Geographic Topo, software, I come up with longer distances. As my hike using the shorter route was between 4.8 and 4.9 miles, adding 0.8, I would put the alternate route at 5.6 and 5.7 miles each way. Mary Ellen also says the elevation gain is 3098, but I have it at 3420 just from the starting and ending elevations. 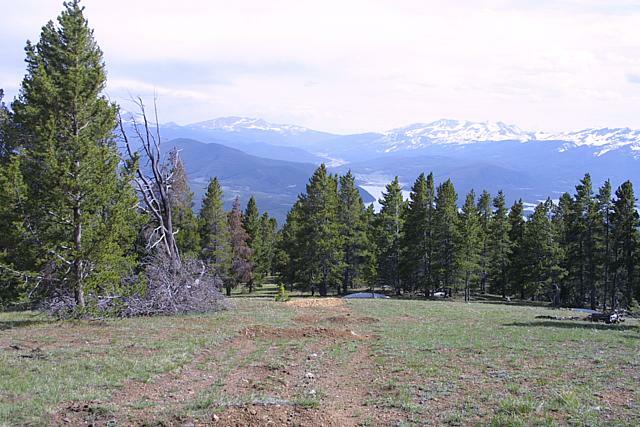 In fact though it is more than that as there are two places where there is a descent, so the total is 3511'. I am trying something new on this writeup. Since this is a mountain I hike regularly, I have divided the hike up into sections that I use to keep track of where I am. I alternate the colors of the sections: red, yellow, blue. I still used my techniques to use the track log information to mark where I was at each hour interval of the hike. 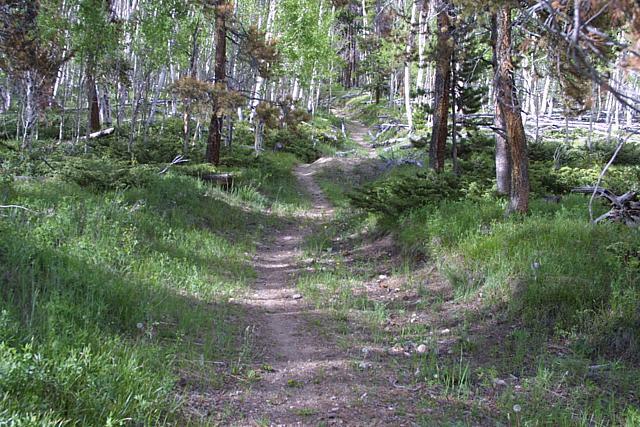 This first section of the trail, leaves the trail head, passes through an Aspen grove, rejoins the road, leaves the road for a meadow that in late May and early June has an amazing set of wildflowers. The climb up this meadow is steep, leveling out just before the end of this section. 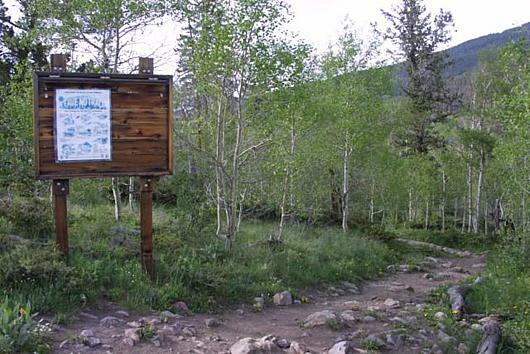 The end of this section is the actual entry to USNF land, indicated by both a sign and the leaving of the meadow for a combination Pine / Aspen ecology. This section on the way up is a brief respite from the climb that you just did. However at the end of the day, if you have made it to the summit, this 74 foot drop becomes a 74 foot gain and can really take effort to cross. On the way up, you enter trees which stay with you (other than some meadows) until you reach tree-line. The Aspens are especially good for helping to cool you off. Keep an eye out on the right and you may see some Columbines. 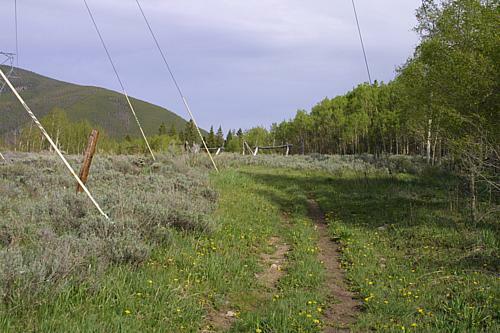 This section ends at the power lines. Section 3: To beginning of main ascent(blue): 0.20 miles, 105 foot elevation gain. It is at this point you leave what is the most popular way up the mountain, and is described in Mary Ellen's book as well as briefly on my Ptarmigan Loop page. 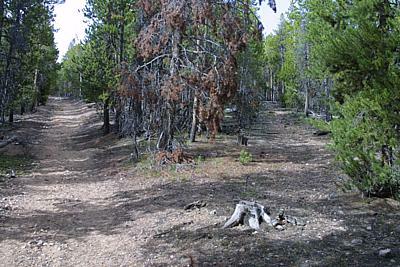 These trails do not come back together until you reach the Wilderness Boundary, at approximately 3.2 miles and shown with the waypoint "alt route" on the map. This is clearly much wider than what is downhill. Also as you start to walk this, you will see every 20 feet or so a pit that has been dug into the road. These pits appear to end at this junction. The pits will be with you all the way to the false summit just before you re-join the alternate route. This section is a cut into the mountain as the left hand side is always uphill and the right always down hill. 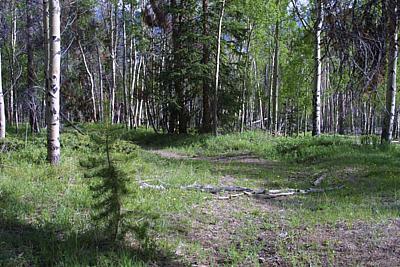 As you leave the point where you see Aspens, keep an eye out and you will see on your left a road going off straight and level. 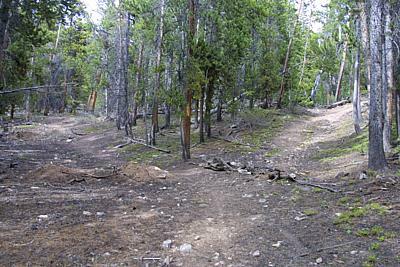 On the way back down, as you start to see Aspens, you should start to look for where you have to take the turn back to Section 3. As long as there are no Aspens around you, you need not look. This section is a relatively straight portion of the trail. It ends with a 90 degree turn to your right. This short piece rates a section by itself as it is a drastic change. The topo says only 48 feet gain, but I think it is somewhat more than that. It is also one of the steepest sections on the hike. I have no clue how a vehicle would have negotiated this before the pits were dug. At the top the road turns 90 degrees to the right and levels out. In this portion, the road starts to follow the topology of the mountain, more or less going up a ridge. The pitch is variable with some spots being level and some climbing. If you wanted to camp and brought your own water, there are many locations on this portion that would make good camp grounds. On the way up this section, you will see two roads (better defined than in section 4) leaving to your right. This first road has no logs blocking it, but the absence of the pits indicate it is not the correct route up. On a later hike, I will have to explore where this goes. has logs across it (at least as of this writing). I am told that there is a hunting camp up this route. Like the first road, I will have to explore this. This road also appears not to have pits dug into it. This section of the hike ends with the road turning to your right and beginning a climb similar to section 4. This section is another cut into the mountain and like section 4 is a fairly straight and constant climb. It always seems a bit steeper to me than section 4. This could be true or could just be that you are higher up. This section has the uphill on your left versus section 4 where it is on your right. While there is no definitive end to this section, I break it at a point I call the "rock garden"
This is a level patch that goes between two sets of rock formations (unfortunately the one on the right did not come out, so this picture will be replaced on the next hike). 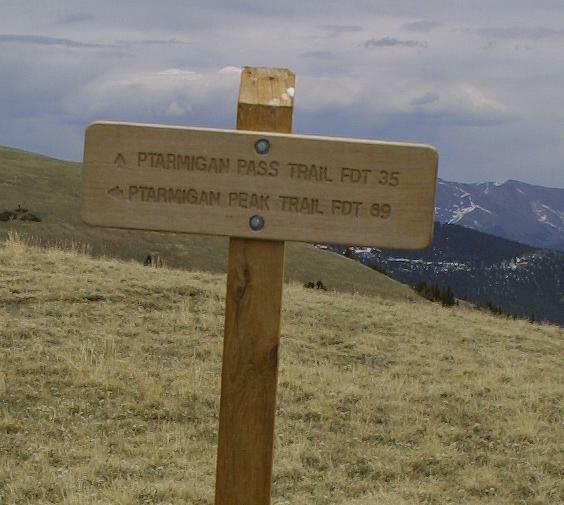 As you level out on this portion, on your left will be the false summit (which I have not visited) at 11,456 feet. It is at this point that the road ends. There are no more pits that are dug. As you reach the end of this level ground, you will leave this section in a descent. 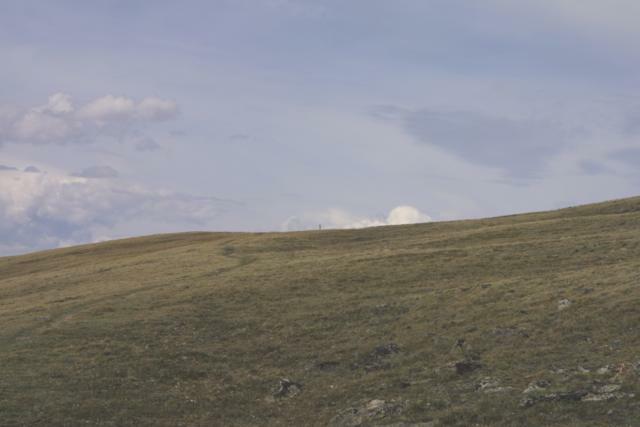 You see the above tree line meadows, and slightly to the left the trail. Where the arrow is in this picture is actually after the alternate route has merged in. 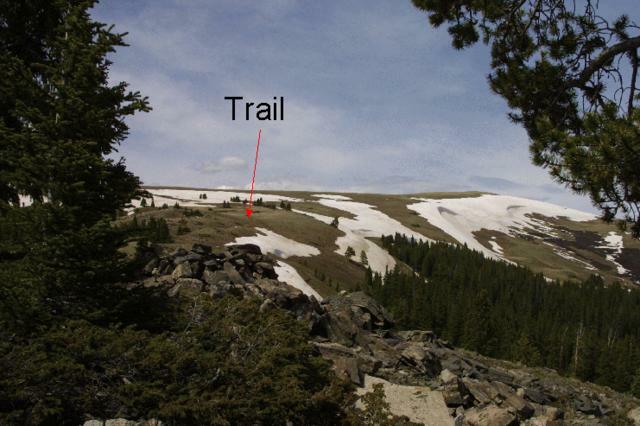 If the trail to this point is still under snow, then I keep to the left (which is slightly higher) and work around, using trees as landmarks. Be sure to look where you have come from as well so that on the return journey you can find the road again (I have done this twice now without any problem, but you should look in case the trail is not visible). 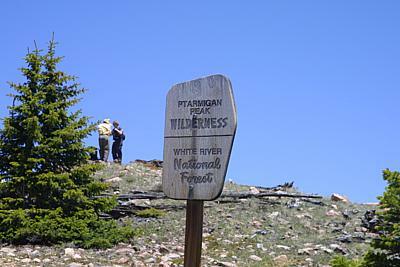 At the end of this section, you rejoin the alternate route up, and enter Wilderness. I have to admit, this picture was taken on last year's loop hike, hence the people. Hard to see in this picture, but it is sticking up on the horizon in the center. During this portion, you have the greatest chance of running into snow fields as this is the last to go. I found a way around the snow. This is the end of Section 10. Note the Cairn behind the sign. This is the summit. 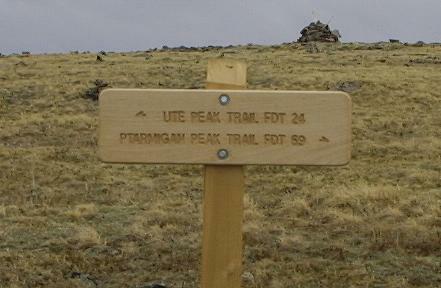 Leave the trail at this sign for a short walk to the summit.